If you stay in Pattaya for more than just a few weeks and enjoy a game of 8-ball pool and meeting new people at the same time, then how about joining one of the many expat pool teams here at Jomtien? Only Jomtien has currently three stand-alone amateur pool leagues with more than 50 bars competing against each other three times a week. And here’s how it all started. 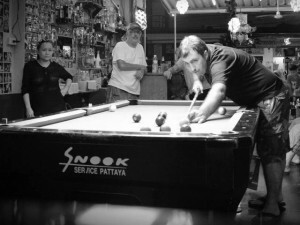 The “old” Jomtien 8-ball Pool League, a local amateur pool “pub league” for bars all around Jomtien, first kicked off in 2003 and, in its original form, survived for 13 seasons. Following the break-up of the original league in 2009, two stand-alone pool leagues emerged at Jomtien, with matches in both leagues taking place every Thursday. While one of these leagues is still being continued and is currently simply known as the Jomtien Pool League, the second league (Jomtien Expats Pool League) also disintegrated in 2011. Later in 2011, bars in the Rompho complex on Jomtien Second Road (opp. Soi 7) initiated their own alternative pool league on Tuesdays (Rompho Expats Pool League), which is exclusively open to bars in the Rompho complex area. A new Monday league also kicked off in September 2014. As a result, Jomtien has currently three stand-alone pool leagues, with matches taking place weekly on Monday, Tuesday and Thursday. On this page you can find weekly updated league tables, match results and fixtures for all three leagues. Following the general meeting at Joy’s Paradise and the trophy presentation function at Winner Bar the new 2017-18 season has finally kicked off on Thursday, October 5. With a total of 14 teams, including several new venues, in just one division, the 2017-18 season will last 26 weeks and will finish in April 2018. The new venues are: 99 Beer Bar and Corner House (Rompho complex) as well as The Richmond on Soi Welcome. The remaining member teams are league champions Winner Bar (Jomtien Complex), runners-up Country Road (Thappraya Road) and Joy’s Paradise (Soi Welcome), Premiers Bar, Woaw’s Pub (Second Road), Champions Bar, Rum Dum, OK Bar, Piss Bar, Starlight Bar (Majestic Condo, Soi Wat Boon) and Buddy’s Bar. Unless otherwise specified, all venues are located in the Rompho bar complex on Jomtien Second Road. 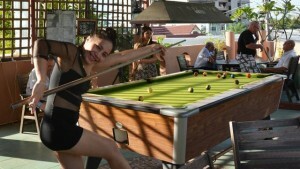 The “original” Jomtien 8-Ball Pool League is the longest-running pool league at Jomtien and kicked off in 2003. It’s open to bars in the entire Jomtien area and currently consists of one division with 18 teams. League matches take place weekly on Thursday; the match start time is 8.30 p.m. The format is 15 straight singles games of 8-ball pool, played in three sets of five games each. Participating teams should have a minimum of five and may have up to 15 players. League matches are played according to the world-standardized (international) rules, i.e. one shot following a foul and “ball in hand” anywhere on the table. Embedded below are the most current league table and the fixtures for the 2017-18 season. The new 2017 (2) season in the Rompho Expats Pool League has finally kicked off on Tuesday, August 8. New fixture lists have been embedded below. The “Tuesday League” is open to teams in the entire Jomtien area and currently consists of two divisions with a total of 23 teams. Matches take place every Tuesday night; the match start time is 8 p.m. The match format is 15 straight singles games of 8-ball, played in three sets of five games each. Participating teams must have a minimum of five players. Three players in each set should be expats or visiting foreigners. Since July 2015, “international rules” (one shot and “ball in hand” following a foul) shall apply. Where possible, the most current league tables and latest results will be posted here every week. Alternatively you can find them on this page. In September 2014, a new “international rules” pool league was initiated by venues in the Rompho complex. It’s open to bars all over Jomtien and currently consists of one division with 16 teams in total. The new 2017-18 season has kicked off on Monday, October 9. League matches take place weekly on Monday, starting from 8 p.m.; world-standardized (international) rules apply. The format is 15 straight singles games of 8-ball, played in three sets of five games each. The winning team gets 3 points, the losing side 0 points. However, if the losing team wins at least five games they will be awarded a bonus point. The most current league table (available to us) and new fixture lists have been embedded below. Hi Stuart, there are currently three leagues in Jomtien, on Monday, Tuesday and Thursday. The Monday and Tuesday leagues are basically just open to bars in the Rompho complex area. The Thursday league (international rules) is open to teams from all over Jomtien. I’m currently running the Thursday league pretty much myself and a new season will start sometime late July. As for the other two leagues I’m not 100% sure who’s in charge at the moment but I’ll find out and give you a call a.s.a.p. HI Stuart, I’m doing the Monday night league at the moment but there is a meeting for the new Tuesday night league next week at Simple Life starting 5pm (Tuesday 16th June) where you can register a team. Hola, will the games on the 27th be rescheduled? If I am correct, I believe it is a non alcohol day (end of Buddhist Lent). Yes, it’s Wan Ork Pansaa or End of Buddhist Lent. Not sure (I’m not doing the Tuesday league myself) but they’ll probably have to reschedule the matches or add an extra match week to the end of the regular fixtures? I would like to contact someone who runs the Jomtien Pool Leage. Hi Pete, if you mean the Thursday league just send me an email as I’m actually running it myself. If it’s the Monday or Tuesday league you’re interested in I can pass your enquiry on to the chairman/secretary in these leagues as well. For the moment only the question. Whe have a new bar in Jomtien Complex with a very good table (only the lamps we have to place) The name of the bar is Man place just at the entrance of the venue cabaret soi and Thappraya Road. We like to start in the competition next season but like to play some practice matches. Can you inform me by return mail about conditions, rules, investment etc. We can play every evening. Please get in touch with Magic again who is now running all three leagues. Hi Bob, I’ve sent you an email and WhatsApp message. I can see the the data sheet for the results of week 5 on Thursday League. BUT where should I find the data sheets for week 1 to 4 ? Patrick, I remove the old tables from Google Drive and this page when I publish the new ones every week. Simply don’t want to keep all the old data – this page takes long enough to load already. Why would you want to look at results from two months ago? Where on this site, can I find the old results of this year for Thursday fixtures. Sorry I just read your answer to my last request. Hi, interested, who should I contact ? You want to enter a team in one of the leagues or just join somewhere as a player?